Husband spent last week in Texas, along with a team of other volunteers, rebuilding a house that was destroyed in last year’s Hurricane Harvey. He has a seasonal business, and that frees him up to be able to do stuff like this…and he is good at building. What they started with on Monday and then what it looked like on Friday. While he was gone, I was solo parenting our youngest Junior Tribe Member. At one point, the JTM asked me to text the coach to ask him a question about an upcoming practice. I realized I couldn’t text him, because I didn’t have his contact info. Y’see, Husband does all the thinking, planning, marking on the calendar, negotiating car pool for our JTM’s sports activities. I help with driving, and I love to watch, but I’m not the point person for his sports. With Husband gone, I had to figure a few things out that aren’t normally my department. Then, later in the week, when a friend dropped by, she handed me a mittful of mail that was in our mailbox. I usually come in the back door, and so rarely check or bring in the mail. Once again: Husband’s department. I hadn’t even realized that the mail wasn’t coming in the house because it’s not on my radar. Husband does it all the time. When Husband came home from his week of building, I had a whole new appreciation for all the little things he does. I realized that I generally don’t look after making sure we have milk in the fridge. Husband looks after the noticing…and then one of us buys it when he says it’s time. I had to make coffee each morning–Husband does that too. While he was with the team in Texas, they had no television and so they spent the evenings playing games and visiting. Husband noticed the richness of it, and has suggested a couple of times this week to turn off the television and talk. The quality of our relationship is on his radar…isn’t that beautiful? There are dozens of little ways that Husband helps our house hum along. I’m so grateful that Husband shares the emotional labor of our home. Husband was a single dad when I met him. He learned, and he will tell you that it was often the hard way, all the things that his late wife, Car, looked after. He had no choice but to figure out emotional labor on his own…and then do it. Husband shares the emotional labor of our household. The received wisdom of the day was that the only way to have a happy marriage was for the woman to give up any aspirations that might threaten the man’s sense of superiority, to make his interests hers, and to never ask for help around the house. Historically, women are the ones that are to make the marriage, family, and household work–and, also, do it so that no one even notices all the things. naming family and marital challenges; doing research on these challenges online, with professionals, talking to friends; and gathering resources and possible strategies; and figuring out action plans for these challenges. This can range from figuring how how to transition an infant to solid foods, worrying about a child’s rash, noticing distance in the marriage, figuring out why an adolescent is sullen and quiet and a 1000 more. Emotional labor is being the quarter back of the house…knowing what is going on in every area of every person and every part of the house and making sure that it all gets looked after. The quarter back of the house pretty much calls all of the plays. To be sure, the quarterback needs a team to give him time to prepare the play, to pass off to, to catch the ball. The quarterback plays because he loves the game, and he plays the game with his team. But being the quarterback is exhausting. It’s not just implementing what needs to be done, it is scanning the environment: the children and the household and the calendar and the fridge and the dishwasher and the washing machine and the carpool and the email and the marriage and the stress level and the season and the upcoming stuff and so on and so on–all the time. But being the quarterback of the team is a lot of work. Marriage in the 21st century with busy lives isn’t meant to be a football game. In this, the 21st century, marriage is best seen as a soccer game. 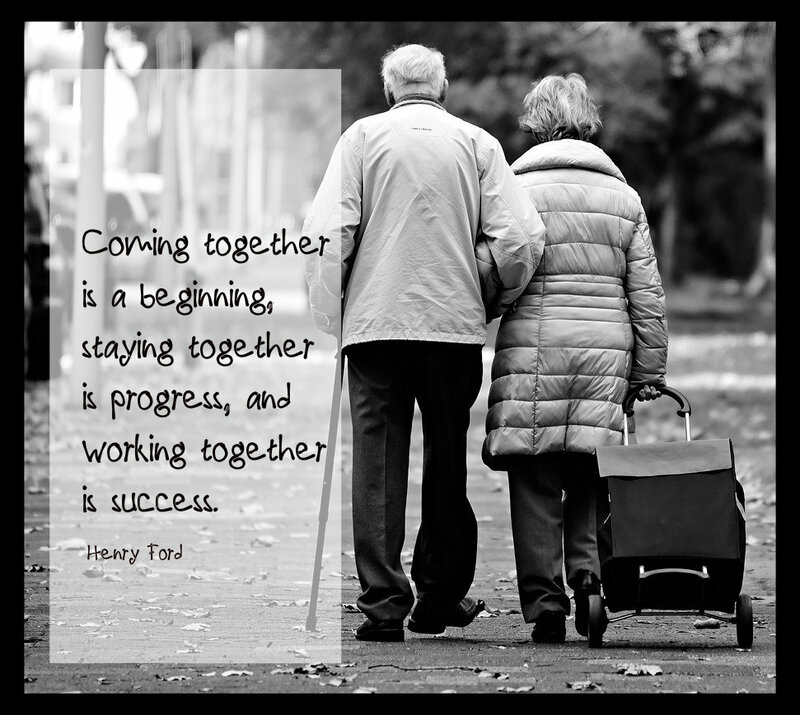 Marriage, is best collaborative, sharing the role of where the ball goes. People having various areas of specialty where they excel and are comfortable, but the relationships is reciprocal and collaborative. The ball of emotional labor gets passed back and forth, from front court to back court. In many relationships, the majority of the emotional labor is done by the female in the relationship. Historically, perhaps there was some logic to it. Now…not so much. Emotional labor is largely invisible. I wasn’t fully aware of all the things Husband does to make our lives work until he went out of town. Most of us don’t know–in fact, we can’t know, all the emotional labor our spouse does unless we talk about it. Sometimes, it’s even hard to talk about it. So…I decided to make it a little easier. 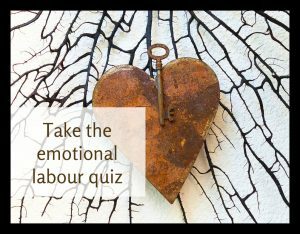 I created an informal, fun quiz that is intended as a starting point for a discussion on emotional labor. 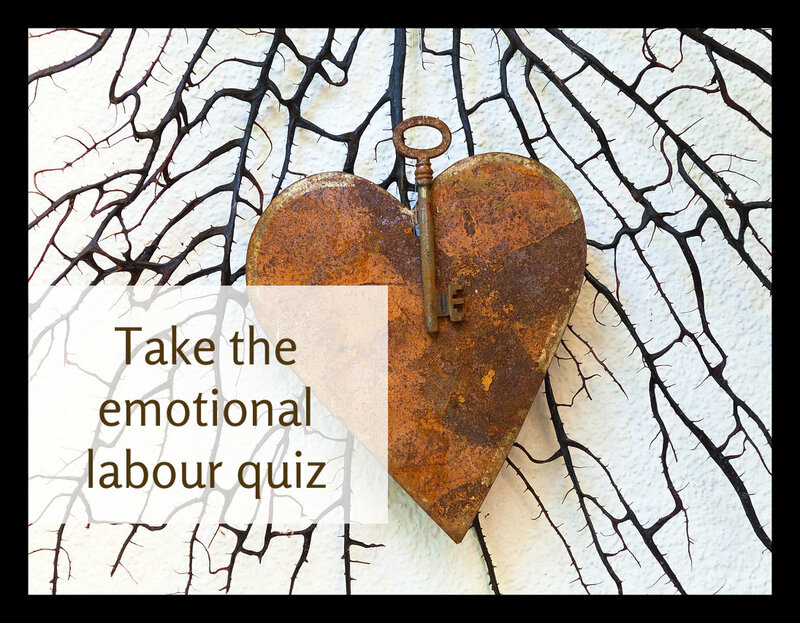 Print off 2 copies and have a little fun…and maybe a little, or even, hopefully, big discussion of our “Emotional Labor” quiz when you and your partner each complete a copy and compare your score! I actually think it’s not fair to blame the person who doesn’t do the emotional labor. The ironic part of carrying the majority of the emotional labor is that: The unwritten job description of the role of the person who carries the burden of emotional labor also generally includes a mandate to not complain about it, or notice it, or mention it–ever. Included in the unstated code of emotional labourer is to do it quietly. The only time the burden of emotional labor comes out is during an argument. This is when the Person Bearing the Emotional Labor (PBEL) has the: Dreaded Meltdown (DM). The DM comes out as a litany of complaints that seem petty and banal, out of proportion to whatever is happening in the moment. The DM comes out loud and long. It feels like an undeserved barrage of negativity. Frequently, though not always, there will be tears. Almost inevitably, the Person who Does Not Bear the Emotional Labor (PDNBEL) gets defensive. Because the over reaction to the single laundry basket in the hallway, or the lack of whole milk in the fridge, or the fact that the sympathy card left on the hallway table wasn’t signed and mailed seems: simply bat-sh*t crazy. Usually, the PDNBEL is actually kind and caring, maybe confused–and genuinely wants the ugliness to end. In an effort to bring sanity to the situation, and in an effort to be kind and sympathetic and make it all better even though it seems completely unnecessary, because the PBEL seems utterly ridiculous, the PDNBEL offers the most obvious, very kind and very noble gesture. While this is intended to be well meaning (without a doubt), it exactly illustrates and compounds the problem. On some occasions, the PBEL will begin describing some items for a list with some relief, desperate to have some things off that mental “to-do” list. Quite often, though, that line will be met with complete exasperation. See…the line, “Give me a list and I’ll help you,” though said in genuine caring, actually perpetuates the problem. The PBEL is responsible for the list, responsible for the carrying out of the list, and now will get help with all that they are feeling responsible for. A husband doesn’t babysit his children–he cares for them. Similarly, a partner doesn’t help empty the dishwasher or help out by buying the sympathy card. A partner simply shares in the duties and tasks of the household. Husband will tell you, if you should visit with him, of the time he stepped around the laundry basket of clean laundry that his late wife, Car, put on the stairs early in their marriage. Car wanted to see how long it would take Husband to notice it and do something about the clean laundry. She had washed, dried and folded it…would he just automatically participate? He walked up and down those stairs for days, moving to the side to avoid the basket. After about 5 days, she gave up and had a conversation with him about it. She decided to address it head on and talk about it. Car decided not to be silently resentful, and quietly overburdened. I don’t know if there was a DM involved or not. She invited Husband to become informed about what he hadn’t noticed. Husband has never forgotten this. He tells the story with a chuckle, but make no mistake…he has remembered the lesson and lives a different life because of it. Cuz…here’s the thing. A person doesn’t know what they don’t know. Notice how “Will you work with me on this?” differs from, “Will you help me with this?” It’s a move from being in charge to being a collaborator. Emotional labor is the intangible effort that goes into keeping life afloat. understanding why there is a struggle. So many chunks of emotional labor have multiple pieces to each of them. Imagine how much stronger marriages would be if PBEL wasn’t overwhelmed and frustrated. Imagine how much richer the marriage would be if the PDNBEL invested in the hidden layers of effort required to keep the household alive? Imagine the intimacy gained by having the awkward but courageous conversations to find out all the ways your partner invests in which you would have no awareness? Dare to have a conversation about this?